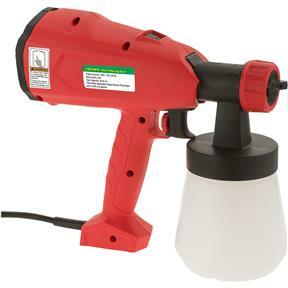 This HVLP Hand Held Spray Gun provides professional results with 350 watt power - good things come in small sizes! HVLP for minimal overspray and less waste, with a variable volume control that is easy to use and provides better spray effect and atomization. The three-way adjustable spray nozzle allows for round, horizontal, and vertical spraying, with no vibration and less noise. 700ml capacity. This paint gun is quite, low to no vibration and the adjustable directional sprayer makes every position convenient.